Testicular microlithiasis is a rare, usually asymptomatic, non-progressive disease of the testes associated with various genetic anomalies, infertility and testicular tumors. According to our literature search, there is no specific data about Doppler findings in this disease. Doppler findings of three cases of testicular microlithiasis during last two years in our institution are presented. Although our hypothesis was to find increased Doppler parameters due to intratesticular arterial compression, our findings suggest that there are no Doppler findings specific to testicular microlithiasis. Testicular microlithiasis (TM) is a rare, usually asymptomatic, non-progressive disease of the testes associated with various genetic anomalies, infertility and testicular tumors [1, 2]. According to the literature that we searched, there is no study on the Doppler ultrasonography (USG) features of TM. In this report, we present our Doppler experience obtained from three cases of TM at Inonu University School of Medicine during last two years, and the ultrasonographic and clinical features of TM. A twenty years old patient, who has been married for three years, with infertility and varicocele problems and pain in his right scrotum was referred for scrotal Doppler examination. Scrotal Doppler USG was performed with Acuson 128 XP/10 equipment and a 7.5 MHz linear probe was used. Examination revealed normal sized testes and multiple hyperechoic calcific foci without posterior acoustic shadowing varying between 1–1.5 mm distributed throughout the parenchyma of right and left testes (Figure 1A). In addition, the right pampiniform plexus veins were dilated (2.5 mm at rest, 3.1 mm with valsalva maneuver) and a reflux of 15 seconds duration was present. The Doppler parameters (Vmax, Vmin, RI, P and S/D ratio) (Table 1) and spectral Doppler examination (Figure 1B) findings were within the normal limits. Infertility work-up of the patient (FSH, LH, P L, total testosterone, sperm analysis), and alpha-feto protein and beta-HCG levels were normal. Chest x-ray and abdominal ultrasound of the patient were normal. With these findings, a diagnosis of bilateral TM and right varicocele was made. The patient had surgery on his varicocoele and was fertile after that. 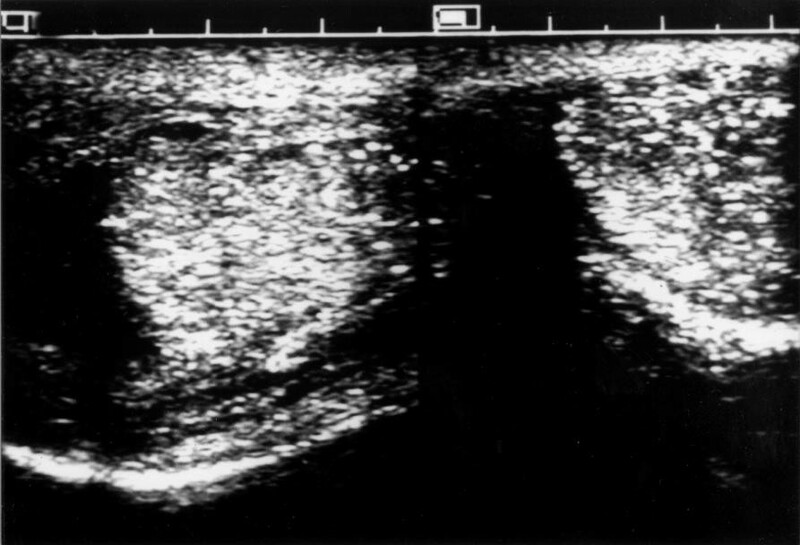 Ultrasound image showing numerous, small, echogenic foci of calcification without posterior shadowing in both testes (A) and spectral Doppler display of the case 1 showing normal waveform (B). Investigated Doppler parameters of the cases. During a scrotal USG screening study an eighteen years old university student was found to have unilateral (left) TM (Figure 2A). Physical examination was normal. Doppler parameters (Table 1) and spectral examination were normal (Figure 2B). Sperm analysis, hormone profile, chest x-ray and abdominal USG findings of the patient were normal. Similar gray scale ultrasound findings (A) and spectral display (B) in unilateral TM in case 2. A twenty-five years old patient with infertility complaint referred to our department for scrotal Doppler examination as a part of a routine infertility work-up. On scrotal USG, unilateral TM (right) (Figure 3A) was diagnosed and Doppler parameters (Table 1) and spectral Doppler examination (Figure 3B) were normal. Sperm analysis of the patient revealed motility and shape problems but his hormonal investigation was within normal limits. Also, the chest x-ray and abdominal USG findings revealed no abnormality. 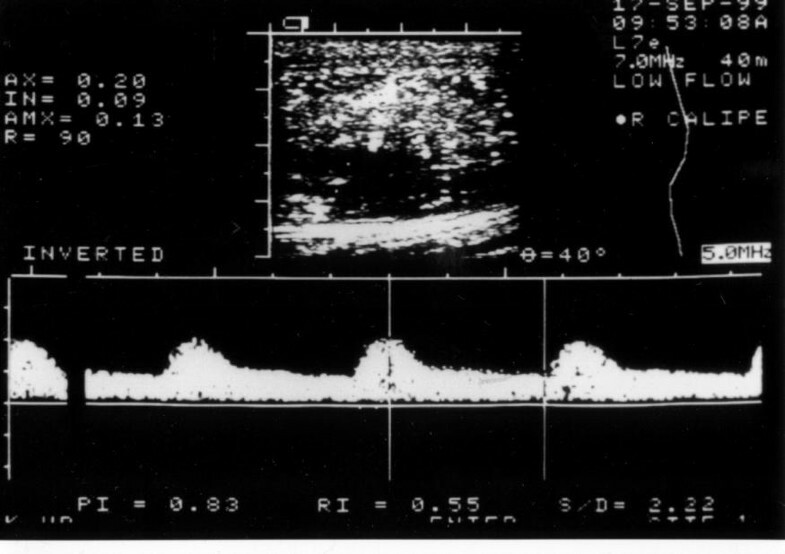 Classic TM appearance (A) and normal spectral Doppler display (B) of case 3. TM is a rare, asymptomatic disease, supposed to be associated with various benign and malignant urological pathologies, and genetic anomalies, usually found incidentally on ultrasound examination performed for other reasons. There are numerous hyperechoic, small calcifications without posterior acoustic shadowing in the testicular parenchyma [1, 2]. Although the incidence is usually reported to be in the range of 0.05 to 0.6 % in the literature [3, 4], there are some reports of 1.3% and 2% incidences, and even an incidence of 15% in infertile patients [5, 6]. Histologically TM consists of laminated eosinophilic calcifications, which are thought to be the result of accumulation of cellular debris and deposition of glycoproteins, located in the seminiferous tubules [7–9]. Although these types of calcifications are present in the majority of patients with TM, they can be seen in 4% of normal prepubertal testes and in testicular torsion, cryptoorchidism, Down syndrome, Klinefelter syndrome, male pseudohermaphroditism and germ cell tumors [1, 4, 7, 8]. TM is reported to be associated mostly with cryptoorchidism; also, an association with infertility and intraepithelial germ cell tumors is also reported [2, 10]. Infertility was the most common finding in our patients and we did not encounter any testicular tumors in these 3 patients. Although it is accepted as a benign pathology, there are no satisfactory long-term follow-up results of these patients. There are reports of TM patients gaining fertility and developing various testicular tumors [7, 14, 15]. One of our cases became fertile after his accompanying varicocele problem was solved. TM has probably benign course but follow-up of the patients are needed. 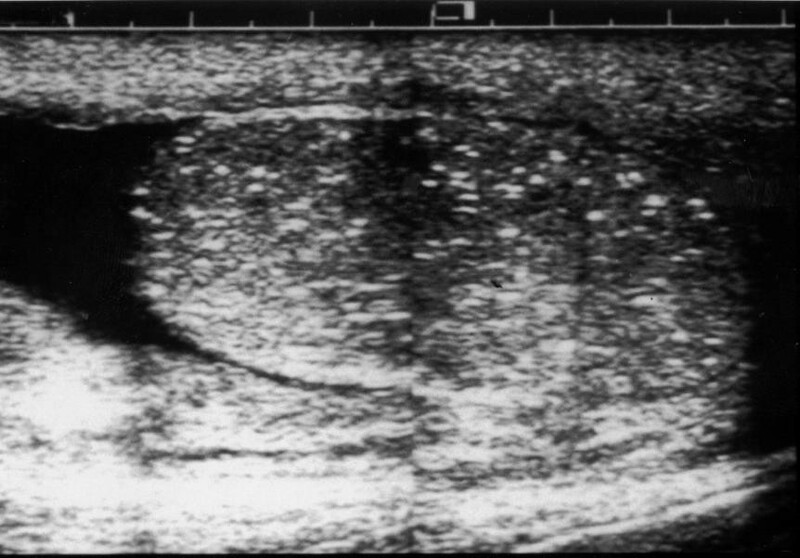 On ultrasound examination, these calcifications are seen as echogenic foci, which are distributed diffusely throughout the testicular parenchyma. They can also be seen as clusters. Although unilateral involvement is reported to be rare  two of the our cases had unilateral involvement. There are no generally accepted criteria about how many echogenic foci should be present to make the diagnosis of TM but some authors classify TM as classic if there is five or more microliths in one ultrasound image and limited TM if they do not match this criterion . The ultrasonographic findings of TM are enough to make the diagnosis just by themselves . Testicular size is normal as in our cases. Usually there is no mass in the testicular parenchyma. There are numerous echogenic foci between the sizes of 1 and 3 mm without acoustic shadowing (if it is seen it is described as having a "Comet tail" appearance) [1, 2, 4, 7, 8, 12]. Some authors call this appearance a "snow storm" . All of our three cases had fulfilled these ultrasonographic criteria. To our knowledge, there are no specific reports of Doppler findings of TM in the literature. We assumed that the resistance indices and velocities would be higher in TM patients due to compression of the intratesticular arteries by those echogenic foci. However, that was not the case in our patients despite extensive involvement of the testes. All Doppler parameters and spectral examination findings were normal. Although larger patient series are needed to establish a firm statement, our results suggest that there are no Doppler findings specific to TM.